This grouping of six Indian Runners has proved very popular as a print. 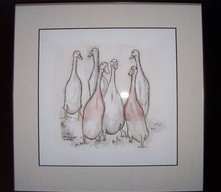 The original is a pen and ink drawing with a light colour wash. It is mounted and framed in a square black frame. The overall size is 40 x 40cms.